One of the things my wife and I love about living in Costa Rica is our weekly trip to the feria, the country’s farmers’ market. Growers from the region meet there each weekend to sell just-picked fruits and vegetables. There are also vendors selling quality meats, poultry, and fish. Not only is the food fresh, the prices are incredible. For example, I can buy three pineapples for just $2, or a kilo of potatoes for $1.50. In addition to the great selection and price of foods there are other reasons we love going there. Most of our friends shop at the feria, so a grocery trip can be a social event. We like to arrange our arrival so that we meet up with friends we haven’t seen in a while. 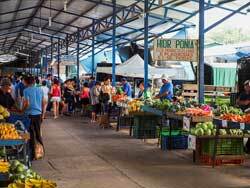 In the center of our market are a few small sodas selling typical Costa Rican food. We love to sit with friends at the soda and sip a refresco (natural fruit drink) while catching up with what’s going on, before doing our shopping. Shopping at the feria has also allowed us to learn about the Tico culture. Haggling is less a part of the culture here than it is in other countries (like Mexico). That doesn’t mean the farmers aren’t competing for business. You’ll see merchants passing out samples and singing and shouting out loud the reasons their produce is the best. But the most important thing in Costa Rica, is developing a relationship by consistently buying a specific product from a specific vendor. Over many months, by supporting the same farmers, we’ve noticed that we get better prices on their products. It makes you feel like part of the community when you have exact change out and they return a couple hundred colones as a discount, or they hand you an avocado or mango as a free bonus. The best part though, is they greet us as friends, with a big smile. 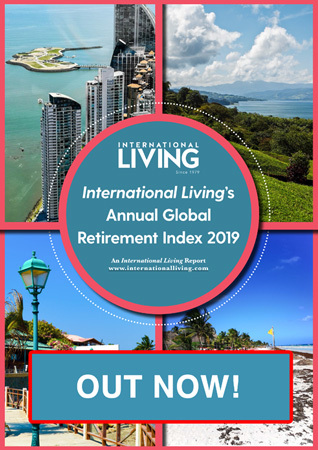 The local feria is the perfect place for expats to interact with the local community, as well as other retirees. Another thing we love about shopping at the feria is the wide variety of exotic fruits and vegetables, and how they change with the seasons. Making our way through each aisle we witness the pride the farmers take in displaying their colorful produce. Oftentimes, a stall will have a worker passing out samples of what they are selling. On a recent trip we were able to try maracuya (passion fruit), guanabana (sour sop), and mora (blackberries). Finally, we use the interactions at the feria to hone our Spanish skills. We have found the vendors to be very patient when we try to communicate, often butchering the language. The market is an unrushed environment and the farmers will take the time to gently correct any mistakes, always with a smile. In addition to practicing Spanish names and sentences, the market is also a great place to practice numbers. One strategy I like to use is to pay in exact change. This forces me to understand the exact number I need to pay instead of just rounding up and getting change back. 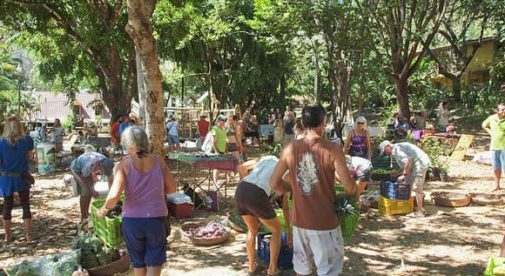 The Costa Rica feria is so much more than just a fresh produce market. It’s a place to meet friends. A place to learn about the abundance of crops that grow in the country. It’s a place for practicing Spanish. And finally, it’s a place to experience and participate in the friendly culture of the Ticos.